Medical staffing specializing in travel and permanent placement for nurses, allied health professionals and physicians. Digitally, CoreMedical Group continues to focus on increasing quality engagement and user experience to further position them as an industry thought leader and key resource provider to their target audiences in healthcare recruitment. In order to gain this status, they sought help with incrementally making improvements to their website along with developing a strong digital and content presence. With user experience, engagement, brand awareness, and conversion at the center of CoreMedical’s concerns, the challenge was to work within the allotted budget to offer a multi-faceted strategy to quickly and efficiently provide an experience for the users across all of CoreMedical’s personas. After the initial discovery phase, it was recommended to migrate the CoreMedical site to HubSpot, which would allow for increased efficiency and flexibility in content + site management. Content was difficult to navigate by users, and hard to manage and publish internally within its original hosting space. Pages needed mobile optimization. Content needed to be optimized with strategic forms in order to convert visitors. Updated graphics were needed for design to engage clients, as well as social and email support to carry them through the recruiting journey. 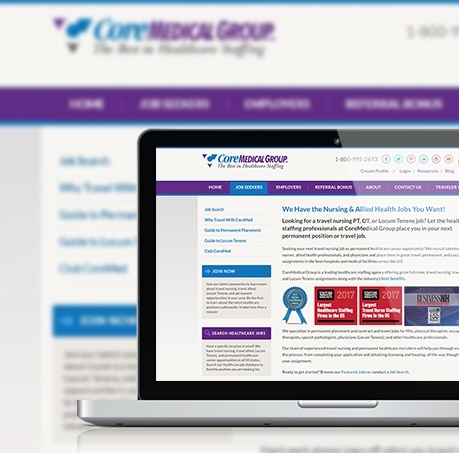 With a focus on increasing quality engagement and experience for visitors, marketing efforts have been successful in establishing the foundations for growing CoreMedical’s effectiveness on and offline, even in the face of significant changes on the web. Through our discovery process we reviewed competitive research, trend analysis, stakeholder interviews, and audience consideration. The new site was built via responsive platform and SEO optimized, and navigation was improved for convertibility of target personas. With the launch of the site on the new HubSpot platform all of their pages also became mobile optimized, which was a desire of the executive team. 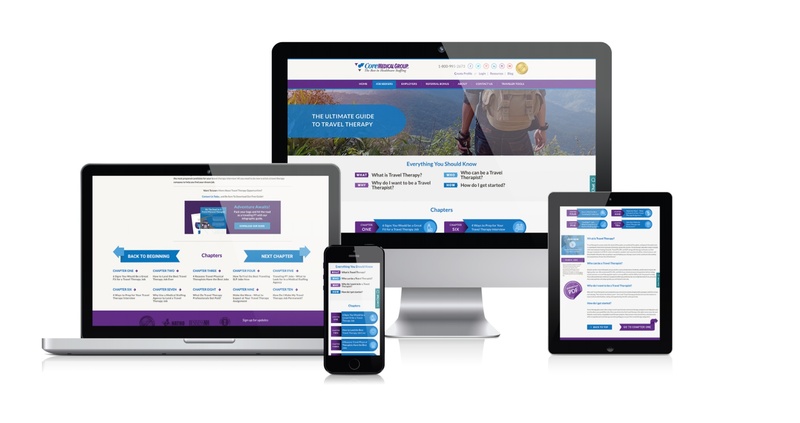 A content strategy was also deployed creating pillar pages, topic clusters and blog content to enhance the user experience and optimization for 5 different units of business that included; Travel Nursing, Locum Tenens, Allied Health, Permanent Placement, and their internal recruiting efforts. Stratagon also helped CoreMedical increase awareness around “Club CoreMed,” a loyalty bonus program that awards points redeemable towards CoreMedical’s exclusive resort vacation packages for loyal traveling healthcare providers. We developed a microsite that highlighted Club CoreMedical and supported the imagery with content about the program offering. Website migrated to HubSpot,which allowed for responsive platform, improved navigation,and mobile optimization. New content strategy developedpillar pages, topics and blogs fortarget personas to find and engagewith the site. Updated graphics and social media publications helped engage and convert site visitors. New microsite featuring loyalty program increased effectiveness. Marketing efforts have been successful in establishing the foundations for growing CoreMedical’s effectiveness, on and offline, even in the face of significant changes in the web. Responsive design continues to be a driver as users are engaging with the site using a wide range of device types. The performance of the site continues to garner strong results. After the first year, CoreMedical committed to increase the retainer partnership with Stratagon by 25% to include Bots, video, additional email engagement, and strategy plus implementation of paid advertising. Increase in engaged users year over year. Traffic increase to the CoreMedical blog. Increase overall in session duration and 10.2% decrease in bounce rate.